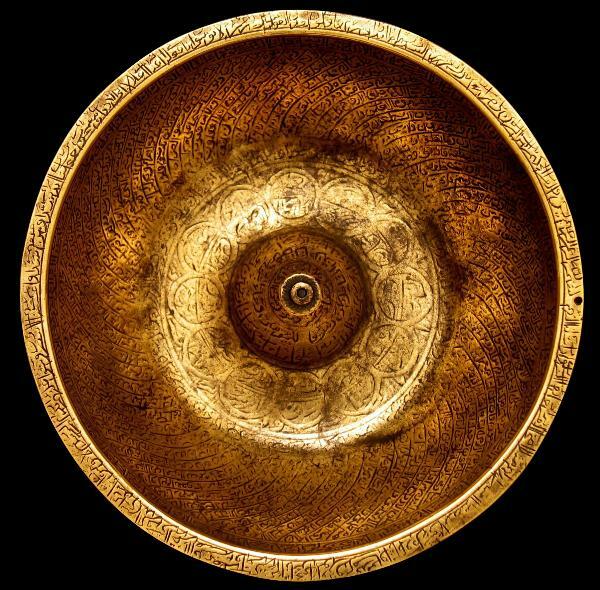 This brass magic bowl is etched all over with bands of Koranic script including a wide band of nasta’liq script on the external sides. The centre of the bowl features a dome that probably had a hole to allow the bowl to be suspended from the middle by a chain. The hole and the central cavity have been filled from beneath at a later time, possible by a later owner. The bowl shows considerable wear from usage suggesting that it is significantly older than the ownership date of 1846.